Booking Daughter and I were so excited when we were contacted by Sherry for HairZing. She was wondering if we were interested in trying out some of these new hair accessories. Well, I probably don't have to tell you that we jumped at the chance. We are both girly-girls and love all things shiny and sparkly! We each received a different HairZing -- Booking Daughter's is the one in the picture and I received a green beaded one. They are absolutely adorable and they do have lots of sparkles. While Booking Daughter and I both have medium-long length hair, we do have different styles and hair textures. What is so neat about HairZings are that they are designed with hair differences in mind -- there are actually three different sizes. I was very worried about fixing my daughter's hair using the HairZing because I am not very good with styling hair (to say the least.) I watched the step-by-step video once to make sure I knew what I was doing; and it seemed easy enough -- click here for all of the step-by-step directions. I was successful in getting the HairZing into her hair on the first try, and we both thought it looked terrific. I will admit that I did have a more difficult time keeping it in her hair, but she does have very fine hair (and she tends to roll around a lot!) I think I definitely need to keep working on the "tug" part of the instructions. HairZing is the original double comb hair accessory. It’s used to create “hair healthy” quick, easy, comfortable, funky, fun and fashionable hairstyles. No two HairZings are exactly alike – the products are handcrafted by women artisans around the world. The HairZing is available in three different sizes—it was created for girls/women of all ethnicities and hair types. With HairZing, you can effortlessly put hair up on the go and look fantastic. If you decide to remove your HairZing later in the day, there won’t be any lines or creases in your hair (which you know is a big deal!). You can even swim with the HairZing so it’s ideal for beach bags, camp backpacks and mom’s purse. If you are looking for an easy, yet fun, way to wear your hair this summer, then I definitely recommend the HairZing. I am amazed by all of the different ways you can style your hair using the HairZing -- a french twist, butterfly, or ponytail to name a few. 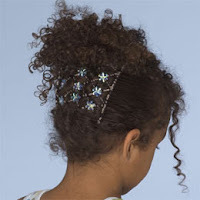 HairZings are also reasonably priced and would make wonderful gifts. Make sure you check out the website to learn more about this exciting new hair accessory! I was hoping to see a picture of you with a HairZing! Yeah, where's the picture of you? :) Actually, I've been wondering about these things - I'll go check out the website. Thanks for the review! Looks fun! But I'm usually hopeless with styling.